YOUNGSTOWN, Ohio – After a local businesswoman was attacked in Mill Creek Park, she’s turned the negative incident into a positive motive to share her story and bring awareness to the measures that can be taken to prevent a similar incident. “You need to be prepared. You need to be able to protect yourself,” she says. The 51-year old woman, who doesn’t want her name printed due to safety concerns, has been going to Mill Creek Park for 30 years, whether to run, walk, bike or kayak. Around 8 p.m. April 26, she was walking on the road between the first parking lot off Sheban Drive and the Wetlands parking lot. She recalls passing multiple park-goers and people in their cars who drove past her. As she listened to an e-book through headphones, a man attacked her from behind, she says. She was dragged into the woods and beaten by the man, receiving injuries to her head, neck and wrist. Some of her teeth were knocked out as well. She’s returned to the area since the frightening attack, but with some precautions. She always tries to bring a friend with her, she wears a whistle around her neck, and she carries a handheld self-defense device, such as pepper spray or a TigerLady self-defense claw, which is modeled after a cat’s retractable claws. Among other precautions, she says, is making eye contact with people, standing straight, keeping aware of your surroundings, knowing where your exits are, having someone walk you to your car if its dark out, and if attacked, be able to “stun” or “startle” the attacker by blowing a whistle, having a self-defense device to use, or poke them in the eyes. After staff and members at Creekside Fitness & Health Center in Boardman heard of the attack, they decided to host two self-defense seminars and they’re looking to hold more in the future. The businesswoman who was attacked attended the seminars held May 23 and 24 to recount the story of her attack. “I spoke with them and shared what happened to me so they‘ll be more conscious,” she says. Tim Gay, Creekside Karate Club owner and chief instructor, led the seminars. Gay is retired from the Mahoning County Sheriff’s Office and is a fifth-degree black belt who has been studying martial arts for 50 years. For the past 20 years he’s also been teaching self-defense to various organizations. Gay started holding self-defense classes after one of the woman at his church was assaulted. The pastor came up to him and asked if he would teach a class. “If I could help one person then its worth it,” Gay recalls thinking when he started the class. For the two seminars at Creekside, 100 women signed up, he says. The first half of the class is lecture-based on awareness and common-sense tips. The other half of the class is spent doing hands-on training. However, the most important thing a person can do for defense is paying attention to their surroundings. Weamer has 15 years in the police force and has trained at Creekside Karate Club with Gay in the past. He helped Gay teach the self-defense seminars in May. When training a new police officer, he says that one of the most challenging skills to develop is being aware of your surroundings. Robert Young of Efficacy Training Systems in Boardman shares a similar viewpoint. 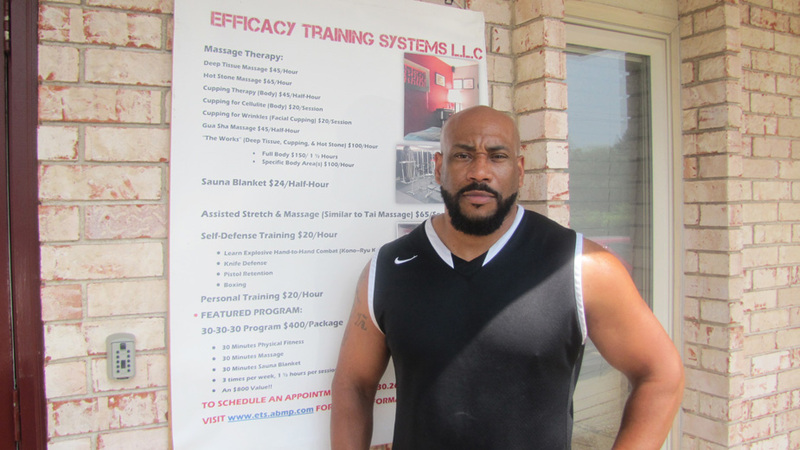 Young is the owner of Efficacy Training Systems and he is a licensed massage therapist, a personal trainer and he provides self-defense training. Young works with both men and women who want to learn self-defense training. Some have had attempted rapes or assaults, he says, and others are teenagers sent to him by their parents who are concerned about their kids going off to college and being on their own for the first time. Pictured: Robert Young, owner of Efficacy Training Systems in Boardman. One of his clients, Nichole Taylor, says she’s been in several abusive relationships, but training with Young since October has helped her with her confidence with the added benefit of knowing how to defend herself. Young creates a foundation of self-defense techniques based on a combination of methods he’s learned from shorin ryu, aikido, jujitsu, western boxing and Chinese martial arts. Once Young thinks his client has a good technique, he creates a hostile environment to “stress test” what they learned. Among the scenarios he simulates are somebody punching them or grabbing them and how to break that hold, how to strike and create a gap, and how to recognize a threat. Young also offers training to business owners, showing staff how they can set up a defensive position if they’re attacked and how to fight their way out of it.